What’s better than being curled up in the bed with warm arms around ya? Lost in each other, not a care in the World…Sounds like words for a “hot” country song…. 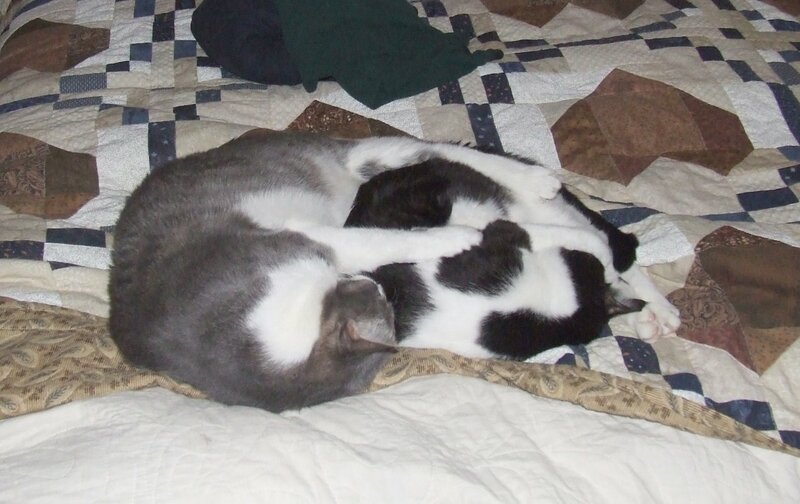 Ernie captured this shot of Sassy (grey/white) wrapped around PB (black/white) kitty. He said he made lots of noise, took several photos and they never stirred a hair. They’re laying on a quilt made from one of Ann Smith’s mystery patterns! These kitties are always entertaining! As for me…I’m glad it’s Friday, we’re going out to dinner, and it’s the beginning of a long weekend! Sewing time! YEAH!! !